I hope you are enjoying this months challenge and all the inspiration. I wanted to share a simple card that can be used for any winter occasion. I have used the new Script Hello Die from Diecember along with Simon’s Frozen Fractals Stamp set which includes lots of beautiful snowflakes. I started off trimming Simon’s Navy card down to 41/4 x 51/2 and then randomly stamped some of the snowflakes using Simon’s Clear Ink. I then used some gold perfect pearls and dusted them over, this gives such a lovely shimmery look. I let it sit for a few minutes and then brushed off the excess using a large fluffy brush. I then die cut some of Simon’s Glimmer card and vellum using the die and adhered them together using Ranger Multi Medium Matte. Once I had then adhered this to the card I finished it off with some Gold Pearl Nuvo drops and added to a couple of the snowflakes centres. This card can have lots of different sentiments added with the hello die, or could just be a just because card. Thank you for stopping by today. I hope you have checked out our challenge. Wow, well I can defintely tell that I’m in holiday prep mode because I totally forgot to post winners from our November Copy a Designer challenge sponsored by Neat and Tangled. Please forgive me! We loved seeing all the amazing entries, and as always there were many fabulous projects! Here are a few standouts – we’d love it if you’d add our badge to your blog! I loved Chark’s take on Tracy’s card! The kraft, black, and white combo with pops of red is stunning! Finally, Melissa’s bold and modern interpretation of Kimberly’s card is amazing! Thanks to everyone who played along with our challenge! Just a quick reminder to please make sure you’re familiar with our challenge rules! There were many entries that we loved that were unfortunately ineligible for a win due to not following our rules! I’m enjoying your entries for our current Winter Holidays challenge and I look forward to seeing the rest of the entries roll in this month. Have a great day! 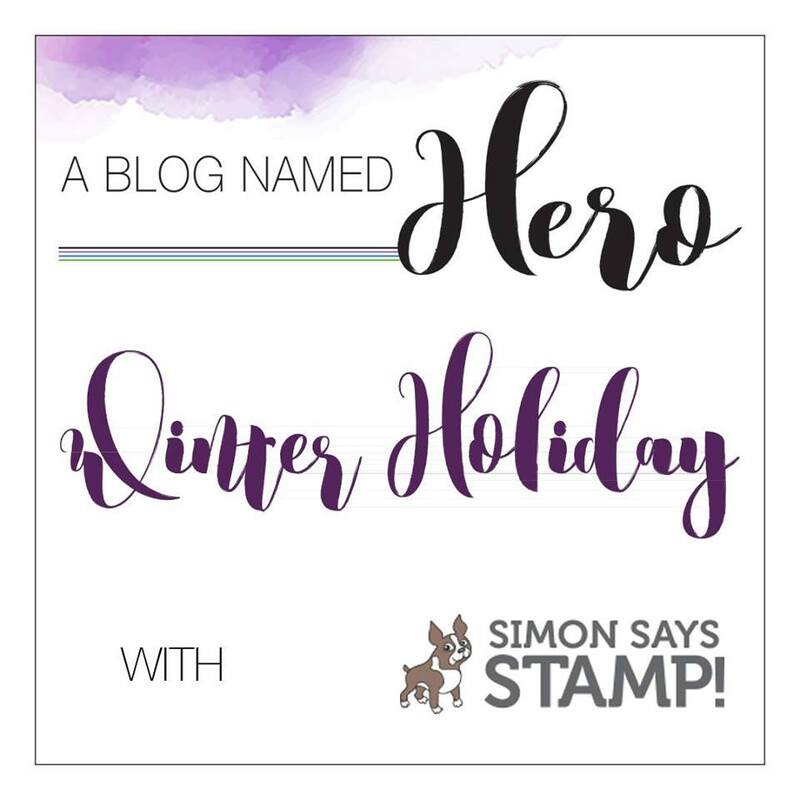 It’s Donna here and I am here with A Blog Named Hero and this month we are collaborating with Simon Says Stamps to help celebrate their fabulous Die-cember release! Our challenge this month is “Winter Holiday”, if you have not joined the challenge, please do. I am using the newly released die from Simon Says called “Everglade Collage”. The penguin is from Hero Arts called Baby Penguin Color Layering stamp set. I die cut the Simon Says Everglade Collage wafer thin die which measures 4.4 x 3.25. I cut another piece of cardstock the same size as the die and used Tim Holtz distress oxide ink Salty Ocean for the background. I sprayed the background with some water and then added some Sheer Shimmer Spritz Spray Sparkle to give the background some shine. I used foam tape and put the die cut image and distress background together and then adhered it to the card. I stamped the penguin with the coordinating colors which are Hero Arts Soft Granite, Charcoal and Black. I die cut it out with the coordinating die and adhered it to the card. I stamped and die cut the hat and popped it up on the penguin and added the bow tie which I die cut out with plaid paper. Isn’t this penguin the cutest? This is a must have in your stash! To finish the card, I added the sentiment which I stamped with versamark on black card stock and embossed and heat set with Hero Arts white embossing powder. I die cut it out and used foam tape and added it to my card. I hope you get a chance to play along with this month’s challenge! All you need to do is use at least one Hero Arts product on your project and follow this month’s theme, “Winter Holiday”. Link up your card for a chance to win a great prize from Simon Says Stamps! Can’t wait to see what you create!! Good morning and Happy December! 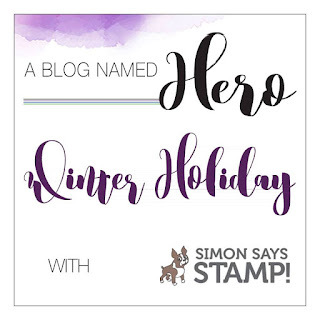 This month we are lucky enough to be collaborating with Simon Says Stamp and we are just thrilled to help them celebrate DieCember! We’re finishing the year up with a Winter Holiday theme! Feel free to submit your favorite Winter, Christmas, Hanukkah, Kwanzaa, or New Year’s cards! Here are some projects from our Design Team to help you get started. Click on the picture to go to their blog post for a closer look at their projects! Hello happy first day of December and Friday. Kelly here to share a card using a new product from our December collaborating company, Simon Says Stamp. I started this card by creating a background using Ranger Alcohol Inks and Yupo paper. I have been seeing some gorgeous alcohol ink artwork on Pi-interest and the blue and pink pieces with touches of gold really caught my eye. Yupo is a plastic paper for watercoloring but is very fun to use with alcohol inks. The alcohol inks spread really uniquely on the Yupo paper. When the alcohol ink was dry I added some dots of gold with a gold leafing pen. The beautiful Evergreen Circle die is a new die from Simon Says Stamp. I used the Merry Stamp and Cut set from Hero Arts for the sentiment. I diecut the Merry 3 times from white cardstock, glued the layers together and colored the top layer with the gold leafing pen. I finished off the card with some Wink of Stella on the trees and some Crystal Clear Sequins from Studio Katia. Please come back Monday to see inspiration from more of the Design Team and for Decembers challenge theme.